At all times before entering the intersection. Only when the traffic is heavy. Only when you approach a stop sign. Vehicles on your left only. An oncoming vehicle about to turn right. 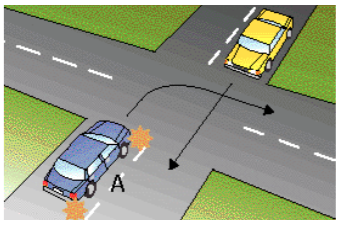 An oncoming vehicle going straight ahead or turning left and any vehicle on your right. 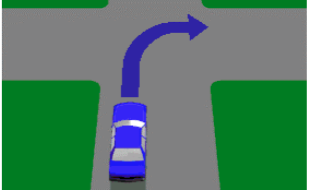 A vehicle approaching from your left and intending to turn right. Yes, whether they are turning or not. No, only the vehicle on the right. No, you have right of way. Yes, it has the same meaning as the sign itself. No, but you must give way if turning. No, you only need to give way to the vehicle on your right. Yes, only if turning left. Yes, only if turning right. Wait until there is room for you to completely cross the intersection. Proceed if there is no traffic on your right. 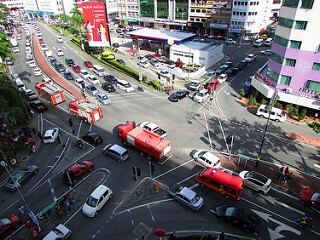 Travel into the intersection and wait until traffic ahead moves. The far right-hand lane or any other lane having an arrow pointing right. The lane carrying the least amount of traffic. Vehicle O must give way to vehicles P, Q and R.
Vehicle O must give way only to vehicle R.
All vehicles must give way to vehicle O. Yes, if there is traffic on your right only. No, if the intersection is clear. 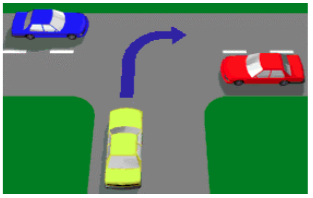 Be ready to stop and give way to all other traffic if there is danger of a collision. 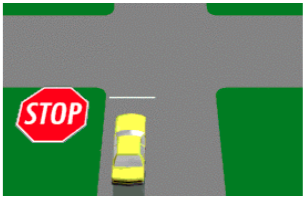 Stop completely at all times and have no right of way. Slow down and only give way to traffic on your right. Only when there is traffic behind you. Only when arrows are marked on the roadway. Whichever vehicle got there last. On the right-hand side of the street. On the left-hand side of the street. The far left-hand side of the road. Either side of the road. Stop at all times and proceed when safe to do so. Slow down to 10 km/h, then proceed through the crossing. Even when there is no other traffic. Only if there is a car on your right or left. 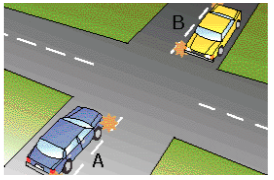 Only if there is danger of a collision with another vehicle. Only when the gate is up and the lights stop flashing. If you cannot see a train approaching. If you can safely go around the closed gate. 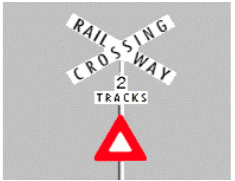 Slow down, look both ways for trains and be prepared to stop if necessary. Increase your speed to avoid any approaching trains. Continue across at normal speed, do not slow down. 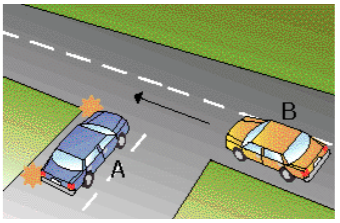 Slow down, be ready to stop and give way if there is danger of collision. Speed up and cross the tracks quickly. Stop completely at all times. 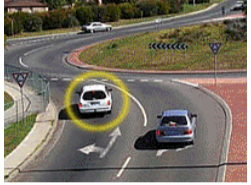 Drive carefully and approach at a speed which gives you good time to avoid traffic which might suddenly appear. Come to a complete stop before you come to the intersection. Flash your lights to let other vehicles know that you are coming. Wait until the intersection is clear. Enter the intersection, but keep away from the Light Rail vehicle. 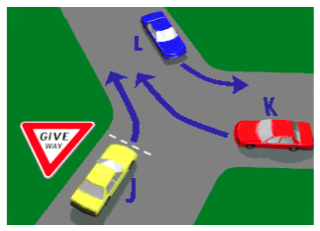 Change lanes before crossing the intersection. Only when there is room for your vehicle on the other side. Immediately after the traffic lights turn green. When the vehicle behind signals you to go. You do not block the intersection. You have the car in the right gear. You do not hold up the traffic behind you. The traffic on the other side of this intersection has stopped. 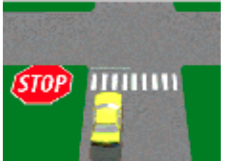 You are in the car shown and want to cross the intersection. The lights are green. What should you do? Wait until there is enough room for your vehicle to cross the intersection completely. Drive through the intersection slowly and hope that it will clear before the lights change. 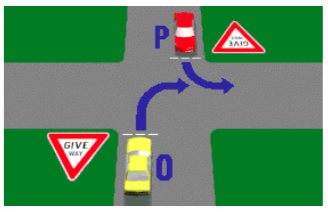 Drive into the intersection and then turn left. 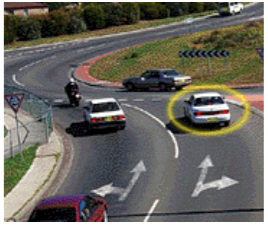 Red light cameras take photographs of vehicles that enter intersections when the lights are red. 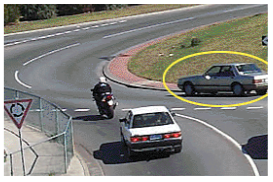 Red light cameras take photographs of vehicles that speed through intersections. 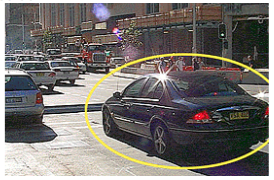 Red light cameras take photographs of vehicles that cross intersections when the lights are yellow. Accelerate as hard as you can. Brake immediately to a stop. Pedestrians must not start to cross. Pedestrians who have started crossing must go back to the footpath. Pedestrians are not allowed in this area at this time. Give way to pedestrians still crossing. Slowly move through the intersection turning left. Before coming to and as near to the intersection as possible. 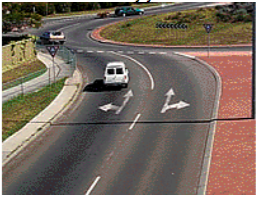 At least five metres before the intersection. At the point where you can see clearly in both directions. 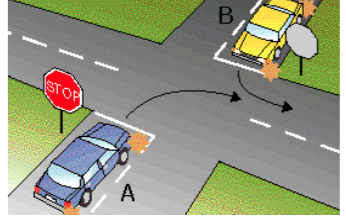 You drive up to an intersection with a stop sign in the car marked A and you wish to turn right. The car marked B facing you also has a stop sign and is indicating to turn left. Who can go first? 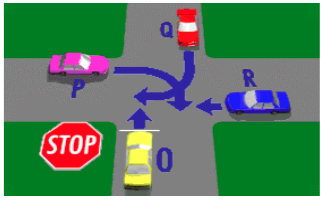 Whoever arrives at the intersection first. This intersection does not have any traffic lights or signs. You are in car A and want to turn right. When can you go? After the car going straight ahead has passed. Before the car going straight ahead has passed. As soon as you get to the intersection. You come to an intersection that does not have traffic lights or signs. 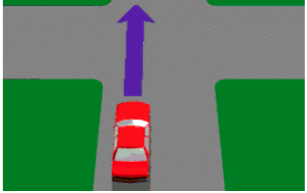 How do you decide when to drive straight ahead? 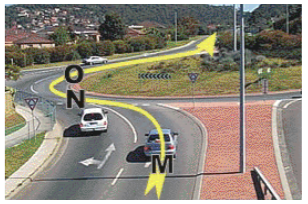 Slow down and give way to traffic going into the intersection on your right. Wait until all traffic has left the intersection. Whoever gets there first can go. 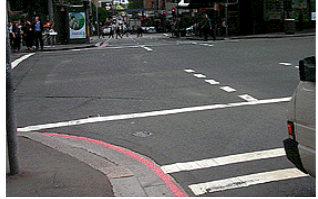 At this intersection there are no signs or traffic lights. You are in the car marked A. You want to turn left. What should you do? 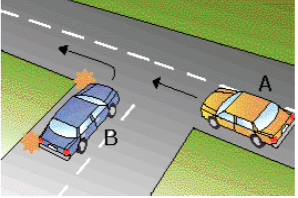 Slow down and give way to car B on your right. Enter the intersection and make the turn. Sound the horn to warn the other driver. Both pass in front of each other. Choose either depending on the traffic. Always follow any instruction they give you. Drive through the intersection as you normally would. Wait for the traffic lights to start working again. You are in car A and are going straight ahead through the intersection. Who should give way? Whoever gets to the intersection first. Left from start to finish. Only if you think it necessary. Left only after you enter the roundabout. You must leave the roundabout in the same lane as you entered. You must enter in the right lane and leave in the left. You must always leave the roundabout in the left lane. Keep in the lane you entered the roundabout. Move into another lane with least traffic. Change lanes to get through quickly. Stay in the right lane all the way round. 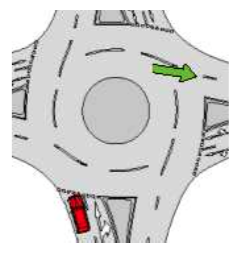 Move into the left lane to leave the roundabout. 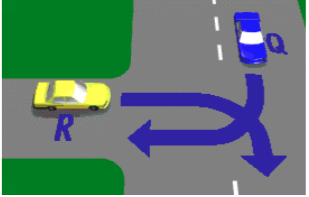 Use the left lane all the way round. 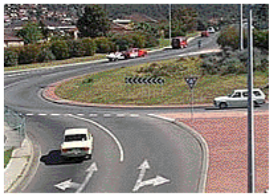 No, the car should enter the roundabout only from the right hand lane. Yes, the car can make the turn only from this lane. 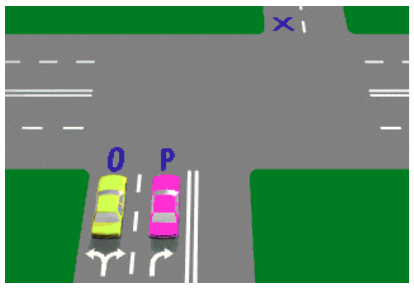 Yes, the car can make the turn from either the left hand or the right hand lane. Follow the directions of the controller. Sound your horn at the traffic controller and hope they get out of your way. Stop at the intersection and then proceed slowly. Give way to the pedestrian. Sound your horn to warn the pedestrian to get out of the way. 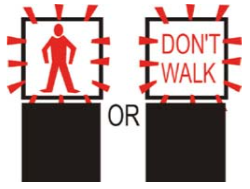 Swerve around the pedestrian to avoid hitting them.